Alex Hultman had never recorded a hat trick in his life. The Roseville forward has scored two goals in a game many times in his hockey playing days, but not once has he put three away in one game. Well, he waited for a good time to do it because the No. 5 seed Raiders defeated No. 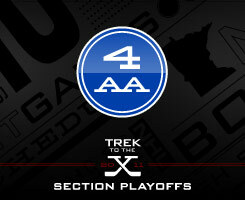 4 seed North St. Paul 3-2 on Saturday, Feb. 26 at Aldrich Arena in Section 4AA play. His three goals give him 12 on the season, a team high for a Raiders team that does not have one of the elite 20-goal scorers that are often attributed to teams with records similar to Roseville. Instead it is mixed with a bevy of players hovering around the 10 goal-mark. Hultman is the first Raider to crack into double digits in goals. It was also the way Roseville scored that has been consistent all season. All three of Hultman’s goals may not have traveled 10 feet before going into the net. Traffic and scrums in front of Polars’ goalie Eric Manteuffel made it hard for the junior to see the puck, let alone stop it. When the puck was loose, Hultman squeezed his way through all the bodies to get enough on his shots. Manteuffel only faced 22 shots in the quarterfinal game, but when Roseville did come, it made it hard on him. Having to first make an initial save and sift through both sets of teams for the puck, getting a clean view of a second or third shot was difficult. After Hultman tied the game with 2 minutes, 50 seconds left in the second period, his line got one more shift in the latter stages of the period. With only 37 seconds left, he was able to bury the game winner while Manteuffel was once again, trying to weed through traffic after a save on the Raiders first shot. Even though the Raiders were outshot, their team defense was the difference in not allowing many quality opportunities for North St. Paul. If Roseville goalie Nick Lehr wasn’t snagging every shot that came his way, a steady group of defensemen would be back to tie up or immediately get the puck from the front of the net. Ultimately, it goes back to Hultman, who was willing to pay a price, getting the garbage goals that happen so often during the postseason. If there is any team that was prepared for close games in Section 4AA it is Roseville. It has played in 10 games that resulted in a one-goal difference or ended in a tie during the regular season, going 3-2-5. Three of those ties consisted of heavy hitters such as Burnsville, Blake and Lakeville South, all expected to make deep runs in the section playoffs. Yet again, the Raiders were in a battle with North St. Paul, but this was a lose and go home situation. "I think it absolutely gets you ready for playoff hockey," Pauletti said. "Especially in a game between the four and five seeds. It's expected to be a close game, which it was, and I think our guys really do a great job handling spots like this." Against North St. Paul, holding onto a one-goal lead going into the third, the Raiders played with level heads and were not frazzled by any sudden offensive bursts from the Polars. "We're used to this," Hultman said. "A lot of our games have been like this and we are just prepared for these." In those 10 games, Roseville barely outscored its opponents, 22-21, otherwise, averaging 2.20 goals a game while allowing 2.10. Pauletti will be the first one to say his team does not score a lot of goals, but also will compliment his starting goalie, Lehr, who ranks second in the state with a .938 save-percentage. "You have to have great goaltending when you play games like we do," Pauletti said. "We have one with Nick. He is right up there in the rankings and his play really shows it. "If we are going to make a run, we need him to continue to play well. A hot goalie this time of the year can be big for our team. Nick is capable of doing that for us." Lehr is quick to deflect any positive recognition to himself and direct it towards his team. He compliments his defense in giving him an open view of shots coming his way. "They always keep things clean by me," Lehr said. "It helps a lot with me getting setup and positioned when they give me a chance to see the shots." With No. 1 seed Hill-Murray next 6 p.m., Wednesday, March 2 at the State Fairgrounds Coliseum in the Section 4AA semi finals next, Lehr and the Raiders defense will need to continue to be sharp. Alex Hultman's hat trick gives No. 5 Roseville a 3-2 win against No. 4 North St. Paul at Alrich Arena in the quarterfinals of Section 4AA. The final goal by Hultman happened with just 37 seconds left in the second period to give the Raiders a shot against No. 1 seed Hill-Murray on Wednesday at the Coliseum in the Section 4AA semifinals. Nick Lehr, who came into the game with a top ten save percentage in the state, was once again steady in net with 26 saves, including all nine he faced in the third. North St. Paul had a power play with 2 minutes, 30 seconds left in the game when Hultman hooked Zac McCarver down. The Raiders were able to kill off the penalty with no real harm. Eric Manteuffel had 19 saves for the Polars. The goals he did allow, all to Hultman, were scrums in front of the net, where he had to make either a first save or sift through traffic in front of the net. North St. Paul scored first on Tyler Oliver's wrist shot that beat Lehr low to his glove side. Hultman scored his first by going to the net and found the puck in the crease for an easy tap-in goal. In the second, Chris Skelly put the Polars up 2-1 when his heavy wrist shot powered through Lehr's glove and trickled to the back of the net. Once again, Hultman crashed the net and put his stick on the puck to poke it in the net to tie the game. He completed the hat trick in the closing minute of the second period when he was able to find the puck in a scrum and get it by Manteuffel. Roseville is the only low seed to advance in Section 4AA and will be one of three Suburban East Conference schools in this section's semifinals. Hultman recorded his first hat trick ever in his hockey career. He stuck his nose in front of the net and that is how he scored all three of his goals. They were all mirror images of each other as the Raiders advance in Section 4AA. Lehr had 26 saves for the Raiders and was in great position all night, making his job that much easier. With one of the best save-percentages in the state, Lehr backed it up with another solid performance, knowing he needed to play well to help his team come away with a victory against North St. Paul. Oliver scored a goal for the Polars, but also was a pest for the Raiders in front of the net. Fans saw Oliver crashing the net and was right on the doorstep if Lehr made a mistake. Early in the game, he gave North St. Paul an early lead with a perfectly placed wrist shot. Only a freshman, there is a lot to smile about for Polar fans in the future.